A sheer rock face with an impressive 600 metre drop into the deep blue waters of the icy fjord below, surrounded by mountain peaks as far as the eye can see. If that sounds like your cup of tea, then the filming location of Tom Cruise’s latest release, Mission: Impossible – Fallout, should definitely be top of your bucket list. ‘Breathtakingly impressive’ does not even come close to describing the views from Pulpit Rock in Norway, known locally as Preikestolen. The popular tourist hiking spot welcomes over 250,000 people a year and has now been made even more famous by its epic role in the new Mission Impossible film. In the movie, Tom Cruise dangles from the towering cliff face high above the majestic Lysefjorden fjord, in true Ethan Hunt style. The scenes were filmed over three days in November 2017, meaning Pulpit Rock was closed to the public for just over a week, with supplies being helicoptered in. While the dramatic scene is actually said to be set in India in the film (don’t worry, no spoilers), Preikestolen is somewhat one of the star locations of the movie and was even featured in the teaser trailer which first aired during this year’s Super Bowl in the US, as well as on Tom Cruise’s own Twitter page, where the actor gave us a taste of what to expect in the upcoming blockbuster. The location became even more famous when a crowd of fans was treated to a unique cinematic experience right on the mountain itself. Two thousand people gathered in front of a giant screen on Pulpit Rock, ready to watch the pre-premiere of Mission: Impossible – Fallout. After the action-packed film ended, they began their 2am descent back down from the cliff, equipped with spotlights and head torches. Located in Forsand, outside Stavanger in Western Norway, the 25×25 metre mountain shelf makes for a five-mile round hike, one which has relatively easy trails and is suitable for all ages. Indeed, during the popular holiday month of August, Pulpit Rock is packed with tourists coming to explore the attraction, which has been dubbed as one of the world’s most spectacular viewpoints by both Lonely Planet and the BBC. If you’re looking to visit this stunning location, then Norwegian offer direct flights to Stavanger from a range of airports including London Gatwick. 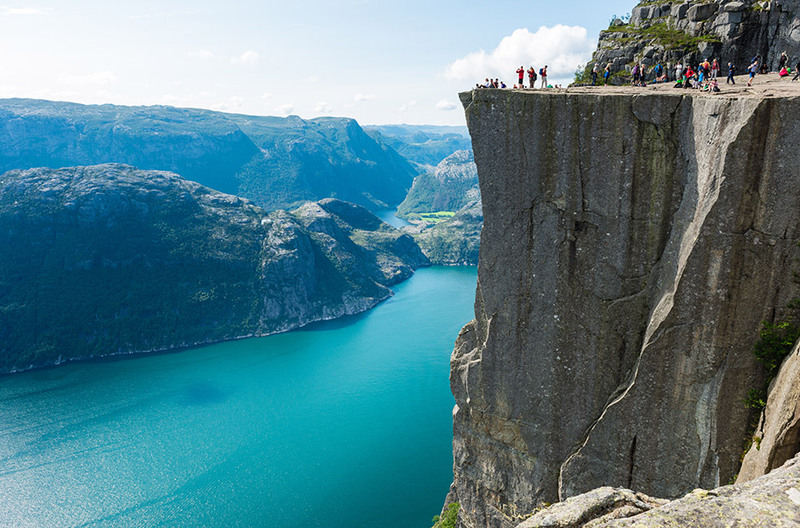 From Stavanger, the Tau ferry is a preferred mode of transport to Preikestolen, and from there you will need to catch a bus to Pulpit Rock Mountain Lodge. Hikers are advised to wear comfortable clothes and shoes, and make sure they have food and plenty of water, as beyond the car park there’s nothing but nature. Be aware that during winter, the weather can cause challenging conditions, with icy trails making the journey far more risky, and nightfall coming much earlier than in summer. Inexperienced hikers should definitely try to visit during the warmer months of the year. Verkshotellet – A cosy 3.5-star hotel in a traditional wooden building, located in Jørpeland. The hotel is only 9km from Preikestolen, but approximately 30km from Stavanger. Price includes breakfast, Wi-Fi and parking. You can also choose to stay in the city centre of Stavanger, which is approximately 26km from Pulpit Rock. Scandic Stavanger City – A four-star hotel with a restaurant located in the city centre of Stavanger. Comfort Hotel Stavanger – A three-star hotel within walking distance from the most popular sights in Stavanger. Skansen Hotel – Norway is indeed expensive, so if you want to save your money for something else, this two-star budget hotel is a good option. It’s located in the city centre of Stavanger and offers free Wi-Fi. Remember: You can earn CashPoints every time you book a flight or a hotel with Norwegian, then use them to make your next flight cheaper. Find out more about our award-winning loyalty program Norwegian Reward.